When Rich in Color first started, the five of us got together on a video chat and talked about what books we were looking forward to reading and reviewing. 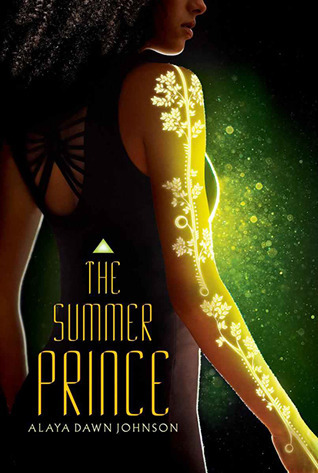 It turned out that all of us wanted to read The Summer Prince by Alaya Dawn Johnson, so we decided the only fair thing to do was have a group discussion. In celebration of this amazing book, we are also having a giveaway! One lucky reader will get to pick between a hardcover or electronic copy of the book. Please note that this giveaway is open to U.S. mailing addresses only. WARNING: There are spoilers ahead! Terrible, end-of-the-book spoilers! Crystal: To start off, what do you all think of the cover image? For me, the design on her skin was stunning and the glow grabbed my attention. I was completely intrigued. Jessica: It’s definitely eye catching. I liked the green-yellow glow on the cover since it connects to the lush green feeling of Palmares Tres. Crystal: I hadn’t noticed the greens that way Jessica, but it does complement the feeling of the place. The verde. I was more entranced with the light so missed that. Lights seem to be pulsing throughout the story: their first art project with the holograms, those in her arm and the lights of the city that “sparkle on the bay”. It seems that everyone is trying to be in the light — to stand out. I kept wondering if June and her friends were all going to burn out they were shining so brightly and living so much on the edge. Karimah: Like Crystal, I was intrigued by the lighting on her arms. The design is beautiful. Also, if you have the hardcover, put it under a light. It will actually glow. I think the choice of the sparkling light of her arms, mixed with the green really complements the feel of the novel, the other-worldly aspect of the story. Jon: Unfortunately I read it on eBook so I missed the cover, except what I saw online. The glowing arm tattoos sold me quick, as I’m a sucker for tattoos, especially nature ones! Crystal: What were some of your first impressions of June, Gil and Enki? Audrey: I loved June’s ambition–I knew from the start she would be doing exciting, unpredictable things in this story. Gil’s first introduction was great because I got to see the depth of his friendship with June and subtle cues about how the culture in Palmares Três differs from mine (“All I ever have to do is smile.”). I was delighted by Enki, but I was wary of him, too, because he was very good at making me suspicious of his true purposes and personality. Jessica: I just realized June is also a month in summer (WHOA). I liked that art was her thing and that she carried it out in an unconventional way. I loved Gil — but I’m a sucker for any or all friendships in books. Enki worried me throughout since he was so alive and magnetic that it didn’t seem like something he could sustain. Karimah: I liked June the most. Here was a head-strong young woman who knew what she wanted and wasn’t afraid to go after it. She was a very complex character in that sometimes she didn’t make the right decisions, but, at this what I loved most about her, was that she owned those decisions. I felt Gil was a less of a developed character, as in the undeveloped love interest so often found in YA novels. He really didn’t serve no other purpose than to love Enki and even though June often said he was her sounding board, I didn’t see it. I think though, that might have been because Enki swooped in and basically co-oped her and Gil’s friendship. He was this dynamic force that consumed both June and Gil. Honestly, I didn’t really trust him throughout the book. It felt like he was too good to be true and while I understand his end game, I still wonder what his true motives were. Crystal: I thought June was strong, creative, and brilliantly alive. She is someone I would want to be around, but I could not live so close to the edge myself. She pushed boundaries all the time. Like Karimah, I didn’t feel that we knew a lot about Gil other than he was “the friend” through thick and thin. There just wasn’t a lot of development with him. Enki worried me from the start. He was even more reckless than June and that didn’t hardly seem possible. Jon: It’s rare for me to be drawn to a main character so quickly, but with June, she immediately felt real, and different than most of the other YA dystopian heroines. I think it had a lot to do with her passion for her art, which gave her such a strong characteristic that I hadn’t read very often in YA. As for Gil and Enki, I think we’re seeing them purely from June’s perspective, which is very lovey dovey, for lack of a better term. It reminded me of 500 Days of Summer, how Joseph-Gordon Levitt just saw Zooey Deschanel as the perfect creature, that was Enki for me (at least at the start). And I agree with Karimah, Gil seemed very flat compared to June and Enki. Crystal: On page 19 there is a quote about this utopia that Odete helped to create, “When the world is destroyed, someone must remake the world. I think you’d call that art.” But this utopia seems to have some huge flaws. The disconnect between the high ranks and the people of the verde in Palmares Tres is considerable. Enki points it out rather significantly in his slave dance. I don’t know that I have a question about this, just pondering. I think a lot of dystopian books go after that angle that after a huge crisis government goes a bit drastic and may even have noble intentions, but it rarely ends up okay for the masses. Jessica: A utopia is a dystopia with its blemishes covered up. (I mean, has there ever been a book about a utopian society that was ACTUALLY utopian?) The fact that the city’s building structure reflects its hierarchical structure is interesting. The people at the top of Palmeres Tres don’t notice the suffering of the people living at the bottom among the algae tanks and whatnot. The physical structure of Palmeres Tres (a vertical one with levels) really highlights the disparity between classes. Karimah: Since I read a lot of dystopian novels, the concept of “attempted utopia gone wrong” can be a bit tiresome, but then I remember the United States in the days & months following 9/11 and clearly, the belief that we must protect ourselves at all costs, has definitely not worked out well for a good number of the people. There is truth in Odete’s comment, someone has to remake the world, but can we call it art when people suffer? I think that those who are in positions of privilege would believe so, but like Enki, us regular folks would greatly disagree. I believe that is why dystopian novels are so popular and why there is a common theme among them of the oppressed rising up against the establishment. In the US, many folks are suffering due to the decisions of a select few and are starting to realize that we need to make our voices heard (ie the Occupy Movement & Anonymous). Adolescents are also aware of the type of world they are inheriting and are starting to be vocal about it as well. I can only imagine how inspired they are by the dearth of dystopian fiction they read. Audrey: I was fascinated by what we heard about Tokyo 10 (mostly from Ueda) and the little we saw of Salvador. Tokyo 10 was simultaneously fascinating and depressing–I especially loved Ueda’s line about how the citizens didn’t realize that if they’d made it to heaven (living in the digital world), it meant they were all dead. What did you guys think of the world outside Palmares Três? Crystal: I felt like I didn’t know much about the outside world at all. Tokyo 10 seemed to have been overcome by their desire for perfection and their fascination with technology. It was definitely depressing. Karimah: I agree with Crystal. I felt bad for Ueda and the people of Tokyo 10. What a sad state to live in, never having the ability to touch another human being again. Though, if you exist as data streams, then the people of Tokyo 10 aren’t really human. They are another species entirely. I kept wondering, however, how did they reproduce and then what will happen to the city when all of the human people die? Can they go back to their human bodies? Are the people jacked in to a large super computer like in the Matrix? All these questions keep coming to my mind and I wanted to know the answers. As for Salvador, I wished we could have spent more time there. All throughout the novel I was really interested in the world outside of Palmeres Tres and I wanted to know what living in the non-pyramid cities were like. It was interesting to notice that while Salvador was a land based city, it still “felt” like a pyramid with the “lower city” and the High City. Audrey: Family was a huge part of The Summer Prince, from June’s complicated relationship with her deceased dad, mom, and stepmother to Enki’s journey to Salvador, where his deceased mom was from. I loved how we got hints about June’s father’s death and how that set June at odds with her mom. Jessica: It was interesting how June struggled against her mother and her relatives. She wanted what they wanted — to achieve with art — but she didn’t want to do it their way. Audrey: Did any of you predict the ending? I was right about Enki’s death (and the traces of him left in Palmares Três) and June’s resulting queendom, but the ending still gutted me. Karimah: Sadly, I kind of did. We all knew Enki’s physical death was a sure thing, but I knew that he would find a way to “survive”. The “Chekov’s gun” moment occurred when Ueda was talking about Tokyo 10 and how the people in his country were living data streams. The minute I read that, I knew what would happen to Enki, so I wasn’t surprised at all. As for June, I had that feeling when Enki mentioned it in a joke, I think, and I felt like he was setting her up. I just wondered when he came up with the idea and I did love how he masterfully pulled it off. It required a number of factors, events, and people, to fall in the right place in order to fulfill his greatest art project and lead rebellion. Jessica: I predict the ending at all. I knew Enki had to die, but I kept hoping he wouldn’t have to. I read the book all in one go and it was so fast-paced (to me, anyway) that I didn’t have time to wonder how the ending would pan out. But, yeah, the ending really got me — the red handprint and everything. Crystal: I wondered when he had thought of it all too. I wanted to know if it had been something Enki had been planning from before he was chosen or if it had just took advantage of the circumstances around him. Alaya Dawn Johnson was following her heart and not her head when she wrote this book. She tells about that here. Jon: I’ve been reading all of Alaya’s interviews, and it was interesting to see what her past books were about too. A lot of them have covers featuring POCs! Here’s an audio interview with Alaya, via Wired podcast (E.C. Myers is on this episode too). I’ve been SO eager to read this book! It sounds amazing, and right up my alley. I skipped all the discussion because I didn’t want to be spoiled, but I can’t wait to get back to this once I do read the book. I always love getting other people’s thoughts once I’ve finished reading. You should read it asap, it’s really fantastic in so many ways! Ahh, I’m so tickled you guys did an immense group chat on this book–I absolutely flat-out loved The Summer Prince. Great to see the discussion on family, art, and the ending (it’s intriguing to me that some of you predicted Enki’s merging with the city, because I totally didn’t!). Funny you thought Stormdancer was so bad when The Summer Prince was so highly praised. The complaint Brazilians have about The Summer Prince are the very same ones you listed in the Sotrmdancer review about Japan. Misuse of words, full of stereotypes, use of culture for giving the book an “exotic” touch. And I’m sure Ayala Johnson’s intentions were the best, but that didn’t make the book fair to Brazilians at all. Maybe you should read some reviews made by Brazilians before you fully recommend this book. Don’t get me wrong, I think it’s great that she wrote a book with a matriarchal, non heteronormative society, with black main characters. But the misuse of words and butchering of cultural manifestations was just cringe-worthy. Thanks for the input. I, Crystal, haven’t seen reviews from Brazilians, so would be interested to hear from that perspective.